Los grupos cuentan con un tiempo de 8 das previos a la llegada para hacer la cancelacin de la reserva . Si la cancelacin no se realiza dentro de este plazo, o si el grupo no se presenta (No Show) se cobrar la primera noche como penalidad. Tambin se cobrar el valor de una noche por salida anticipada. Favor informar al hotel sobre requerimientos y/o solicitudes especiales. Es posible que estas tengan un cargo adicional dependiendo del tipo de solicitud. 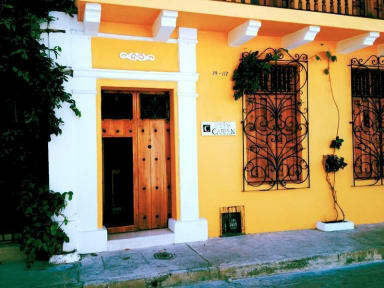 Favor enviar al hotel listado de nombres de viajeros y preferencias de acomodacin. Antes de realizar la reserva, favor comunicarse con el hotel, para verificar la disponibilidad. 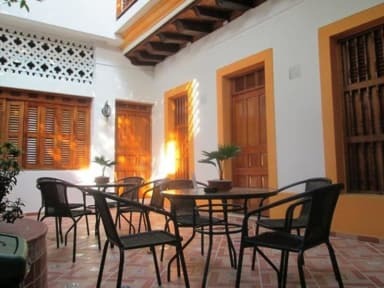 All guests have access to the peaceful central courtyard and the rooftop terrace with panoramic views of the city and several of its major landmarks, including the Castillo de San Felipe de Barajas, Convento La Popa, and La Torre del Reloj. #1: Large guest room that accomodates 4 guests in one double bed and 2 twin beds. #2: Standard double room that accomodates 2 guests in one double bed. Features a built-in closet with ample storage space, perfect for guests planning a longer stay. #4: Extra large guest room with private balcony. Accomodates up to 6 guests in two double beds and two twin beds. #5: Two-room suite that accomodates 4 guests in one double bed and 2 twin beds. Yes, the room was nice and clean, but that's about it. The wifi only works in front of the recption, the staff is only spanish speaking. At checkout we had to email them our confirmation 3 times, apperently they didnt have it, but wanted to charge the double price. We didnt see any other travellers during the 7 days, so it was a bit boring (also: no bar). And you are not allowed to smoke in the patio. All in all: it's ok as a base if you're out a lot. But not cool, if you want to hang out there.